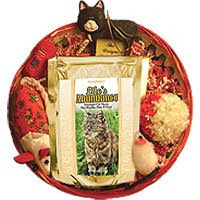 Our Healthy Pet Net website has some great gift baskets for dogs and cats. The gift packages include toys and treats. Something for under the tree for your special furr balls ... or maybe a grandpuppy or sponsored pet. I wouldn't put them out until you've got the tree area under supervision. The aroma may get your furr friend a bit too anxious. Patience is not generally a pet virtue.